When the topic of a horrible tech support experience came up over dinner Monday night, just about everyone’s jaw dropped when I said I had just had a wonderful experience that morning. But when I said, simply, “I own a ThinkPad”, a few said “Oh”—understanding implicitly that my statement was true. When I told the story, one even noted that the result was a bit better than what they would expect of Apple. My problem was simple—I needed to order a set of recovery discs, so I can start from scratch and resolve some driver issues, and was expecting to pay the list price of $45. ThinkPad Recovery Discs, sent next-day air, for a cost of $0. I need to step back a minute, and properly describe the situation. This laptop was built at the end of 2009, and although when I bought it off of eBay it was in near-new condition, I am the third owner–the first was a company who liquidated a bunch of equipment shortly after buying it. The second was the intermediate guy on eBay, who flipped a bunch of it for a profit. Somewhere along the line, one of those two wiped Lenovo’s original factory recovery system off the hard drive. But the first owner had purchased the extended warranty, which doesn’t expire until sometime in 2013. The next statement reminded me why my last three laptops have all been ThinkPads. Chris asked me for the model number and why I needed the recovery (no success in installing a couple of I/O drivers), and then walked me through the steps of trying to launch the factory recovery system. I was quite sure it wasn’t there, but following his steps confirmed my suspicion that it had been wiped. That was good enough for Chris (having an open ticket on one of the driver install problems didn’t hurt), but then we ran into a small wrinkle. My laptop came with Windows 7 Pro 64-bit installed, and that’s what the factory specs for this model says it was shipped with, but his system said Windows XP. To resolve this, he asked me to tell him if there was a Microsoft OS sticker on the unit. Just my word that it was there, and that it said “Lenovo” and “Windows 7 Pro 64-bit” was enough for him. I didn’t need to read the license key or e-mail him a photograph. And he never asked me for my address—it was already in the system from a previous support call. With that, he said that my discs should arrive in 3–5 days, and we said our good-byes. Chris was the only one I talked to—I never got transferred to India, to a supervisor, or even put on hold so he could get approval for the free discs. 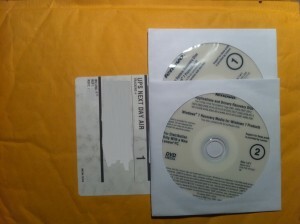 The discs didn’t take even 3 days—they arrived Tuesday via next-day air. One DVD with Windows 7, and another with all the ThinkPad drivers. It was this second disc that most impressed me. It was clearly labeled with the model numbers and specific types it was designed for. This is key—because my specific model number and type were both printed on the disk, I have no doubt that Lenovo sent me the correct model. Every bit of this experience was pleasant for me. I’ve only ever owned ThinkPads Of the four laptops I’ve owned over the years, three have been ThinkPads, and they’re the only ones I’ve really enjoyed using, and experiences like this further cement my loyalty to them. If you want to have a loyal customer base, this is the level you must rise to. Not only must you build amazing hardware, you must provide an amazing customer relationship—even when they aren’t the original owner. Next Next post: Where did all the IrDA ports go?